On Friday after school, our family participated in the Halton Interfaith Food Drive by delivering flyers door to door. My church, Trafalgar Presbyterian, along with other local faith communities were gathering food for the Fareshare Food Bank. Drivers and other volunteers went by those same houses on Saturday to collect the nonperishable items that people left out on their front porches. It was great to participate in such a cooperative program. It was also great to have an opportunity to see the gardens on a few streets where I normally don’t go for walks because they are not in my immediate neighbourhood. 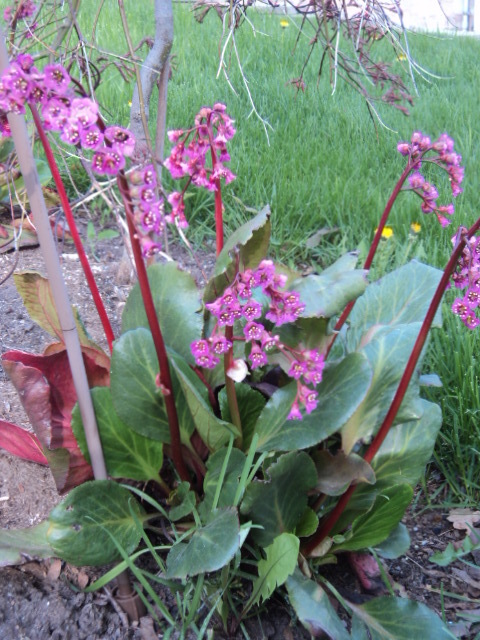 I saw some pretty specimens, like the pink Bergenia at one house that caught my eye. I don’t recall ever seeing it before but now have found it in half a dozen gardens since. In one of the new condominium developments near Walmart, for instance, there is a front flower bed devoted to it entirely. But it was not just individual plants that I enjoyed on our walk; I also took note of the garden ‘pictures’ as Patrick Lima calls them. He has written an entire book on “The Art of Perennnial Gardening”, recognizing that it is not only individual plants that make a garden beautiful, but their various combinations and placements. Somehow, in a neighbourhood that was not my own it was easier to see the big picture, like visiting a new church where one tends to notice things like the tissue box on the piano that long time attenders have ceased to see anymore. 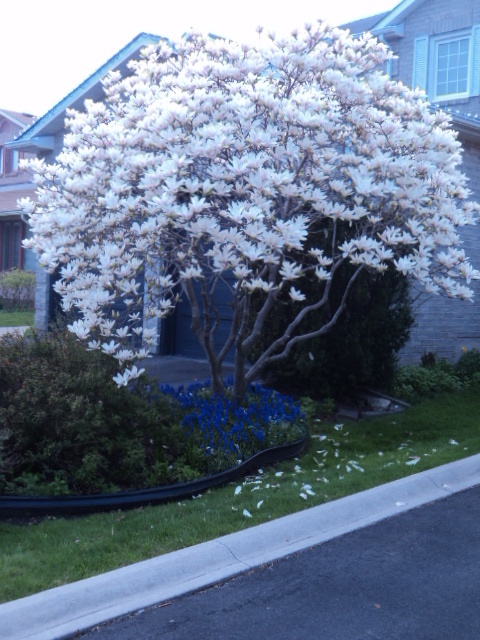 The combination of trees in full flower with the spring bulbs underneath them was striking, like this white magnolia tree standing in a pool of grape hyacinth. 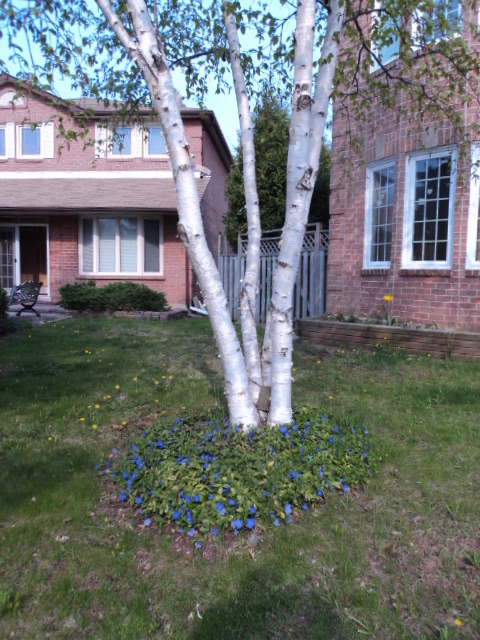 The white paper bark of the birch tree provided colour in the garden in a way that I had never considered, too. The blue and white combination was striking–all the more so with a few yellow dandelions dotting the lawn around it. Unlike the rest of the weekend, Friday was a glorious day, sunny and warm. And we soaked up every last drop as Tucker and Emily ran house to house stuffing flyers into mailboxes and doorhandles. By the time the rain arrived, our task was complete, the kids were tired, and I came home to look at my own yard just a little bit differently. Good work all around. This entry was posted in Uncategorized and tagged beauty, landscaping, neighbourhood. Bookmark the permalink.